Here's an epic list setting out 50 of the best law blogs and websites where you can learn all kinds of things about the law. Some are funny, some serious, some cover the business of law and so much more. Whether you are an aspiring law student, a practicing lawyer or just a regular person trying to deal with legal issues, having sound knowledge is a guaranteed way to succeed in any endeavor. While books can be too hard to digest and there’s only so much that Business Insider can cover, the way to stay ahead is to follow different law blogs and websites that the internet has to offer. Here are the top 50 blawgs and law websites that you must check out. When it comes to the best law blogs and websites, Above the Law ranks above all others. Having a simple and decent layout but highly informational content, this website is the perfect fit for the layman and professionals alike. It provides news, reviews, and insights about different law institutions as well as different people serving in the industry. With over 80 articles posted each week, Above the Law leaves no stone unturned in covering legal matters from every angle. If you are looking for ideas to promote your law practice, then look no further than West Coast Trial Lawyers’ website as it is the perfect example of online marketing done right. 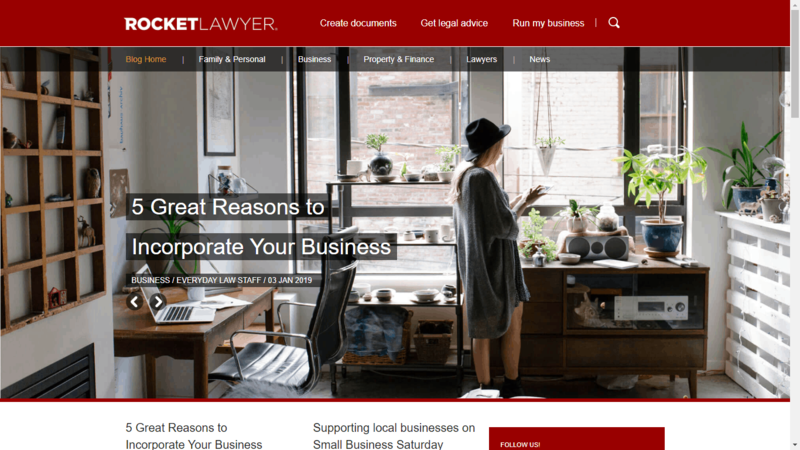 From crisp and catchy messages to the prominent display of rankings, this website is surely effective in attracting clients to Law businesses. Formed over a decade ago, Lawyerist has now become the most popular online community for lawyers all over the world. Be it solo practitioners or small-sized law firms, Lawyerist is the platform where lawyers share ideas and exchange advice. They gain insight from each other’s experiences to enhance their career by improving their skills. Established over a decade ago, SCOTUS Blog is the go-to law blog for anyone interested in law and the US Supreme Court. The team at SCOTUS is dedicated to providing a comprehensive overview of the Supreme Court of the United States (i.e., SCOTUS). Whether you want to improve your practice or are curious about what goes on behind the magnificent doors of the highly revered building, the easy-to-understand analysis of various cases presented on this blog is just what you need. Be it the registration of your new car, tax payments, transferring property and so on, everyone has to deal with legal matters at one point or another. Rocket Lawyer simplifies your work by providing users with useful tips and affordable legal services. Their goal is to highlight the different ways in which the law can make anyone’s life better. Founded by Julie Zerbo who is now its editor-in-chief, The Fashion Blog caters to both, the fashion and law industries. It focuses on objective fashion laws and provides business analyses for lawyers, designers, as well as for the fashion industry and business executives. Run by a US citizen, the Canna Law Blog is ideal for Canadians given the topic of focus. A topic that has been a matter of interest in the country for a long time. The Canna Law Blog is more like a platform where various aspects of cannabis law are discussed along with the people involved in this growing industry. This blog is powered by content written mostly by law professors. It is anchored by Eugene Volokh who teaches free speech law. The blog also covers the religious freedom law and the relevant laws in place between the churches and the state. Thousands of attorneys from all across the globe have benefitted from the Rainmaker Blog, as it offers ingenious techniques to build better referrals and run effective online marketing campaigns. The blog targets small and medium-sized law firms and teaches them how to win more clients for their business. Law and Liberty is presented by Liberty Fund which is a privately owned educational institute that aims to improve the society by making individuals more responsible and self-aware. The site hosts debates, essays, commentaries and publishes book reviews and interviews pertaining to the basic principles of law and freedom in today’s society. The Crime Report is a complete and comprehensive site that caters to all the issues and challenges that arise in criminal justice. 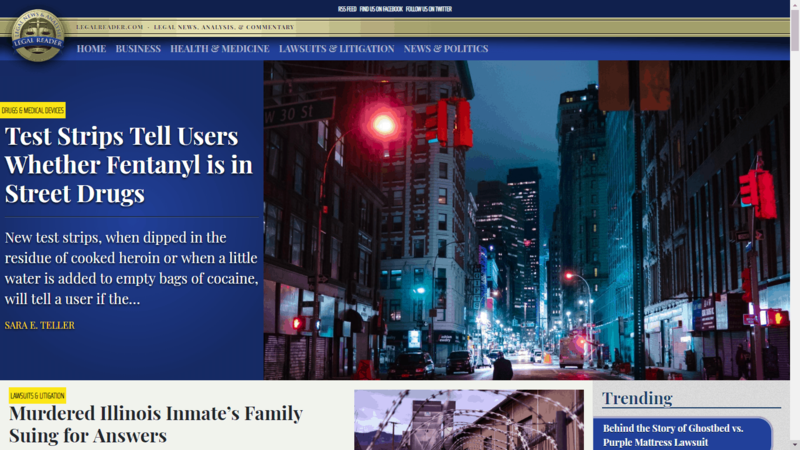 This award-winning site sources its content from expert journalists in New York, Los Angeles, and Washington. It covers analytical reports, commentaries and various other findings on crimes committed in the US and abroad. China is not just taking over the world economy at a fast pace – the Chinese economy itself is quite large as well. China Law Blog seeks to educate the world about Chinese law and its influence on local business practices. For anyone involved in Chinese trade or planning to do so in the future, this blog is a must-read. The Expert Institute is true to its name. It brings together 100 leading law personalities, individual practitioners, boutique firms and various other entities to provide expert advice to its clients. The site is best for attorneys who want to learn the tricks of the trade. The Biglaw Investor targets lawyers as well as other professionals in the high-income bracket. It teaches personal finance and sheds light on several useful topics that are usually not taken into account in the curriculum of most law schools. Ranked as the leading website for law students in India, Lawctopus is helping various fresh graduates to kick-start their career. Offering internships at different law firms and companies, this site also provides an opportunity for young lawyers to publish research papers, participate in essay competitions, and attend seminars and many more. 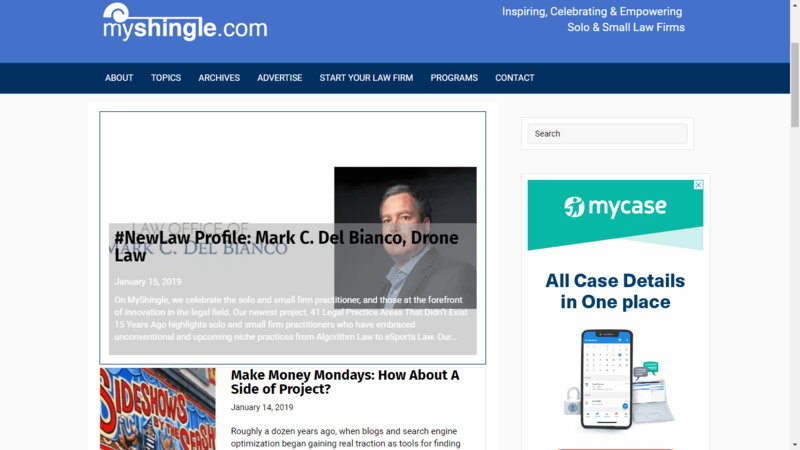 Featuring live streaming of judgments, new reports, interviews, special coverage, videos, and other data, Legal Desire is one of the biggest legal news and information brands out there. From the fundamentals of law and order to contemporary legal events, this site covers everything when it comes to global and local news. Intelligize caters to the needs of professionals in fields such as law enforcement, risk management, legal management as well as government officials and accountants. It offers a solidified network where users can gauge their compliance with government rules and regulations, as well as build better practices. You can subscribe to the Bloomberg Law Podcast which is a platform dedicated to online legal research. It hosts content pertaining to different legal issues, proprietary company information and offers a lot of information to lawyers, law students as well as any other individual involved in legal matters. Legal matters such as divorce, custody issues and other similar issues can be really stressful. People looking for such services or those who are involved in these situations can get uncomfortable and anxious, given the circumstances. YLaw Group helps break the ice with their fascinating website. With amusing content to equally amusing pictures, this is one of best lawyer websites that make its clients less hesitant to hit ‘Contact Us’. As is evident by its name, Roulston Urquhart Criminal Defense is a criminal defense law firm. Their website is audacious, bold and even slightly intimidating. But this only adds credit to their services because this is exactly how a client expects a criminal defense lawyer to be. Be it the dark and daring hues or the grim and serious attorney profiles, Roulston Urquhart Criminal Defense is the ideal example of how to design your website in line with your law service. Being an environmental law firm, Bick Law LLP hopes to deliver ‘knowledge that reaches new heights.’ they provide environmental litigation and transactional services that are customized to meet the needs of each client. Whether you plan to serve in the same sector or not, you can surely learn some problem-solving skills from Bick Law LLP. This website is a fine example of an effective law website. Besides the contrasting color scheme, the simple images and brief text captivates the visitor and encourages them to explore more of the site and the numerous services offered by the law firm. Marketing a law firm can indeed be a very daunting task. But Robbins Firm makes it seem effortless with their illustrative drawings, plain yet faultless design and messages that truly hit home. Their tagline that ‘We don’t follow the standard playbook’ gives the visitor a sense of relief that the company has what it takes to solve their legal problems. Tremain Artaza might be a complex name but this law firm’s website is quite the opposite. Easy to navigate, simple yet attention-grabbing, this website immediately gives their visitors a sense of relief when they are looking for legal help. Legal matters can be quite difficult to grasp and therefore, this site features a comprehensive FAQ section to guide their users through the process. Parris is a well-established law firm that combines a plain web layout with powerful messages to capture the user’s attention. Proudly displaying ‘over $1.4 billion won’ coupled with smiling and confident attorney’s images, the site boldly assures the clients that they will be well looked after. People who think that law is dull and boring will be proven wrong when they visit this website. Lash & Goldberg LLP is a business litigation law firm that puts the above stereotype to shame with their bright and colorful homepage. Focusing on business executives and other similar professionals, this site uses the right strategies to lure customers by providing them with just the features that they want. When it comes to hiring an attorney for any given purpose, the first thing that comes to mind is the cost involved and the procedure that need to be followed. Spring House Law understands this well and therefore, features a brief yet comprehensive roadmap to a successfully completed typical law case. If you are looking for inspiration for your law firm’s website, then W3IP is the site to visit. The company serves in fields such as digital law and intellectual property law. It markets its services subtly yet effectively with strong web design and intuitive navigation that is unlike any other website. Strictly Business is the ideal blog for lawyers who focus on niches like business startups. This blog is for entrepreneurs, venture capital, as well as the private fund industry. Strictly Business is managed by Alexander J. Davie who himself is an attorney at Riggs Davie PLC (located in Nashville). From corporate matters to securities and business law, this site has got all the newbies covered. Lawyard is Nigeria’s leading legal portal and for the right reasons too. Its website is loaded with information that is highly useful for anyone learning the basics of law or even looking for an interactive platform to seek help from others. UK Constitutional Law Association aims to encourage the study of constitutions and enrich users with valuable insight into UK’s constitutional laws. Run by Eric Goldman, this blog offers information on various laws pertaining to marketing and technology. It is good for corporate attorneys or business managers planning to run any advertisement campaigns. As is evident by the name, European Law Blog is equipped with highlights and commentaries on the current developments in law and order in European countries. Besides catering to European lawyers, the blog is also great for attorneys whose clients are based in the UK. This online publication covers international news in sports and the law governing those sports. It provides professional commentary as well as the latest advancements in the legal realm of sports. The blogs, vlogs, videos, and podcasts are all produced by people who are actually working in the relevant fields. This is what makes the content so authentic and useful. The Court focuses on the Supreme Court of Canada. The platform is buzzing with active participants who provide reviews and commentaries on the upcoming cases, past hearings, and analysis of the latest Court judgments. This blog is dedicated to serving people who were involved in automotive accidents throughout the state. The published posts are focused on educating citizens on their legal rights as well as keeping them updated with the latest modifications in Auto law. This blog is run by Jeff Richardson who is an attorney in New Orleans, Louisiana. iPhone J.D. is one of the oldest websites that centers around users of iPhone and iPads. Broadcast Law is managed by attorney David Oxenford. Oxenford is the owner of Wilkinson Barker Knauer LLP and represents radio and TV broadcasters. He educates them on the music licensing issues as well the transaction and regulatory matters. Scarinci Hollenbeck has over fifty offices in New York, Washington DC, and New Jersey. their website presents insights on regional firms and other business matters. Published by Foley Hoag LLP, the Trademark and Copyright Law blog is the best site to visit when looking for information on intellectual property rights. Being the experts in this field, this law firm has access to the complete database of names and marks, therefore; guiding their clients accordingly. The site prepares and files all applications for trademarks and handles all the hassles associated to it on behalf of its clients. The Food and Drug (FDA) law blog is owned by attorneys Hyman, Phelps and McNamara. Its primary audience is regulatory professionals and fellow attorneys who need advice on issues in the same field. The blog reports matter on an as-is basis without being slightly biased. The Talkleft blog covers political news related to crime and injustice. The content is posted for the awareness of the general public, journalists, policy makers and the criminal defense attorneys at large. The site was introduced back in 2000 by defense attorney Jeralyn Merritt and the fact it is still a hit today proves the usefulness of its posts. Personal Injury Law is a blog by the Diamond & Diamond law firm. It houses a team of attorneys whose primary areas of practice are the legal matters that follow car accidents, personal injuries and untimely death. This blog provides 360-degree coverage of the laws that define the world today. Legal Reader is intended to protect the consumer rights and therefore, is not at all hesitant in putting forth the bitter realities of the corporate world. Specifically tailored around residents of British Columbia, this blog is run by MacIsaac & Company. This law firm’s motive is to help injured people know their rights and to help people find out whether they are entitled to make injury claims or not. 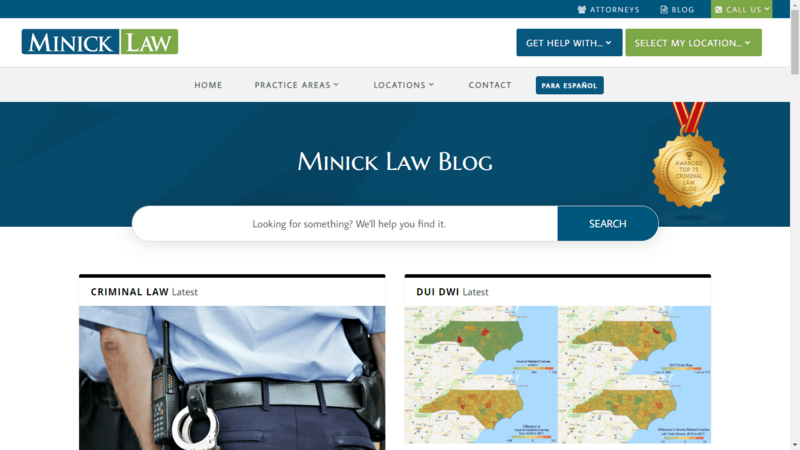 If you have any queries related to basic legal matters or want to access authentic information about legal processes in general, then Minick Law’s Legal Blog is the all-in-one solution to your needs. My Shingle was amongst the first 100 lawyer blogs that appeared online. But despite being around for a very long time, it is nonetheless one of the most modern and updated law blogs. It offers a vast array of free eBooks, blog posts and various other checklists and forms that are essential for starting and managing small and solo law firms. Whether you are into politics or not, Election Law Blog is a must follow for every adult citizen. In this blog, Rick Hasen explains the A to Z of elections. From campaign finances and legislations to voting rights, initiatives and the Supreme Court’s nomination process, this site is a handy guide that balances the law of politics and the politics of law. Knowledge is power. With these law blogs and websites, you can get a strong hold on legal issues, build your law practice and gain sufficient knowledge to excel in the field.